Twenty turn hysteresis free adjustment allows pressure settings to 1″ WC resolution. Four adjusting styles allow maximum design flexibility. The non-rising stem is available with an attractive knob, or plain, allowing installation of OEM knobs. Also available is a flush adjusting shaft, for applications where pressure setting is changed less frequently. Factory pre-set “tamperproof” models are also available. Plastic construction – corrosion resistant wetted materials. High accuracy – Low effect of supply variation on output. Low cost – Perfect for OEM applications. 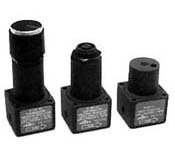 Note: R-910 series regulators are not recommended for dead-end, no flow applications. A downstream relief of at least 20 cc/min is recommended. Note: R-920 series regulators have “near zero” bleed to atmosphere under normal operating conditions. Should any overshoot, or downstream pressure increases occur, the unit will relieve only what is necessary to stabilize the pressure setting. Important: Proper filtration is a must to maintain correct operation of the R-920 Series. 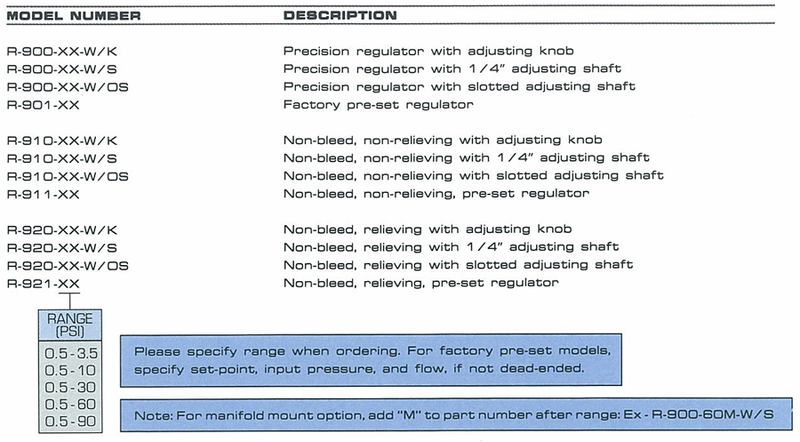 Airtrol Components Inc. cannot guarantee perfect “non-bleed” operation under any circumstances. Consult with an Airtrol Application Engineer for more information.